The number of Mexican migrants apprehended at U.S. borders in fiscal 2015 dropped to the lowest levels in nearly 50 years, according to U.S. Border Patrol data. This change comes after a period in which net migration of Mexicans to the U.S. had fallen to lows not seen since the 1940s. 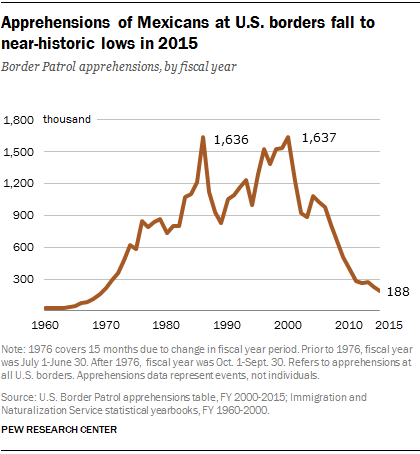 This decline in apprehensions coincides with recently released estimates by Mexico’s top statistical agency, which show that the rate at which Mexicans migrated to the U.S. and other countries – including both legal and unauthorized immigrants – has held steady for the past five years, after a dramatic drop during the Great Recession. Apprehensions of Mexican migrants declined to near-historic lows last fiscal year, which ended Sept. 30, 2015, according to data released earlier in the year by the U.S. Border Patrol. (U.S. border apprehension data are commonly used as an indicator of the flows of migrants entering the U.S. illegally, though they are only a partial measure.) In fiscal 2015, the Border Patrol made 188,122 apprehensions of Mexican migrants at U.S. borders, an 18% decline from the previous year – and the lowest number of apprehensions on record since 1969, when there were 159,376 apprehensions. The decline suggests unauthorized immigration flows from Mexico could be falling. In addition to the latest trends in apprehensions, new data from the Mexican government’s main statistical agency (Instituto Nacional de Estadística y Geografía, or INEGI) show that the level of emigration of Mexicans from their country to the U.S. and other countries remains well below levels prior to the Great Recession that began in 2007. 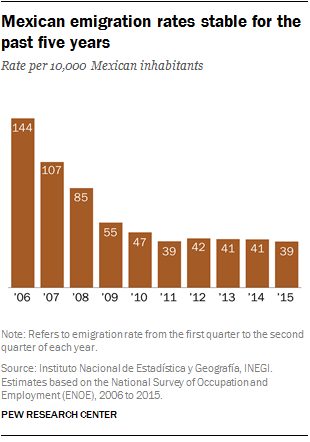 In 2015, the emigration rate to other countries was 39 per 10,000 Mexican residents during the second quarter of the year, little changed since 2011 and down substantially from 144 per 10,000 during the same quarter in 2006. Among Mexicans who do emigrate, the share choosing the U.S. as a destination has fallen somewhat. For example, between 2009 and 2014, 86.3% of Mexican emigrants who left Mexico migrated to the U.S. In the 1990s, that share was about 95%. Population numbers through 2014 in the U.S. similarly indicate the possibility of a decrease in unauthorized immigration from Mexico. Overall, there were 11.7 million Mexican immigrants in the U.S. in 2014, down from a peak of 12.8 million in 2007, according to Pew Research Center estimates based on U.S. Census Bureau data. The number of unauthorized immigrants from Mexico was down by about 1 million over the same time period, from a peak of 6.9 million in 2007 to 5.6 million in 2014, according to Pew Research Center estimates. The drop in Mexican emigration to the U.S. during and since the Great Recession has at least three main causes. First, there was a decrease in the number of jobs available in the U.S. to Mexican immigrants, particularly in construction. Second, since the mid-2000s there has been stricter enforcement of immigration laws at the U.S.-Mexico border (with the number of Border Patrol agents now above 17,000) and an increase in the number of deportations of Mexican immigrants. Third, there are demographic changes underway in Mexico that could be affecting would-be immigrants. Today, a declining share of the population in Mexico is made up of people ages 15 to 29 (24.9% in 2014 versus 29.4% in 1990) – and immigrants are more likely to migrate at younger ages, particularly between the ages of 20 and 30 years old. This reflects the decline of the fertility rate in Mexico since the 1970s, which has led to a decades-long process of population aging in Mexico. As Pew Research Center reported last fall in an analysis of Mexican and U.S. data, migration flows from Mexico had recently reversed for the first time since the 1940s. Between 2009 and 2014, some 870,000 Mexican immigrants arrived in the U.S. while about 1 million left. This change followed on a five-year period of net-zero migration from Mexico after several decades of large inflows of Mexican immigrants into the U.S. These new findings provide some insight into Mexican migration flows into the U.S. in 2015, but they do not do the same for migration flows back toward Mexico. In other words, while we have a sense of the number of migrants who came to the U.S. from Mexico last year, we do not have a sense of the number who went back. Not until new population data from Mexico (which includes measures of return migration) and more reliable data from the U.S. are available will a better picture of Mexican migration flows to and from the U.S. in 2015 be possible. As a result, these new findings provide an only partial look into flows across the border.